And because everything is teensy, you’ll use a minimal amount of supplies, so the stakes are low. (You can even make this with scraps, or a charm pack.) 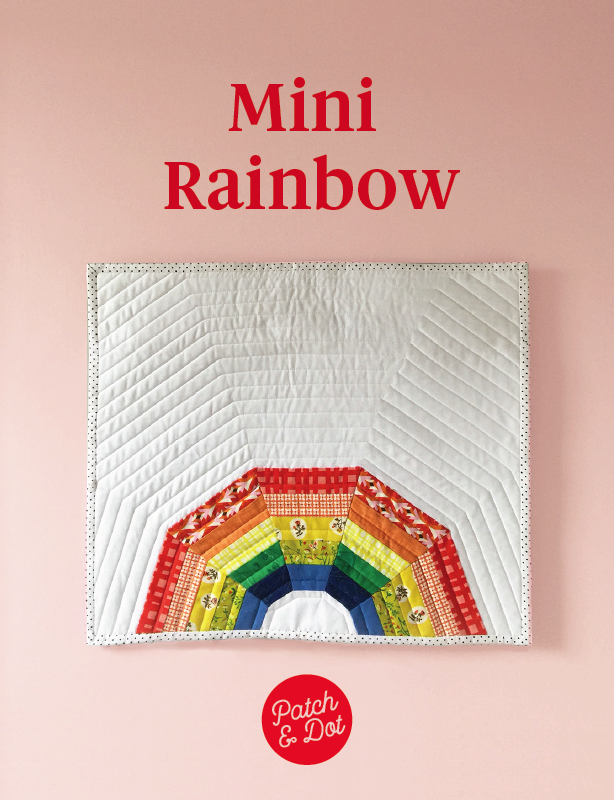 The finished quilt will be about 18.5 x 16 inches, the perfect size for a doll quilt or small wall hanging. 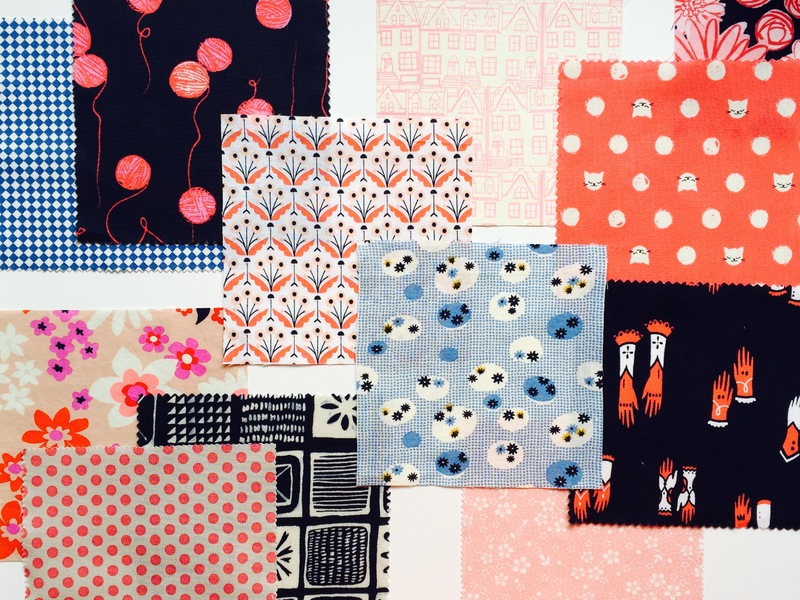 A word about fabric selection. Small projects like this are a great way to play around with colour, volume (how light or dark the fabric is), and scale. 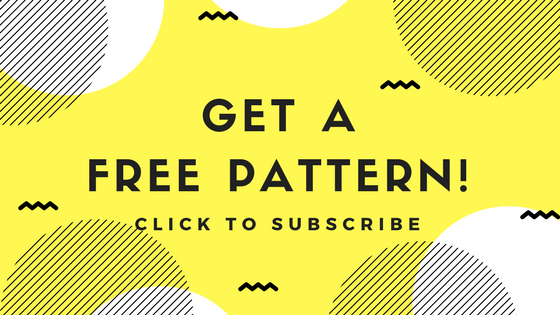 I tried to choose a mix of each, but you could go for a more uniform, monochrome look by working in a single colour, or choosing prints that are more alike. Use a 1/4 inch seam allowance throughout. 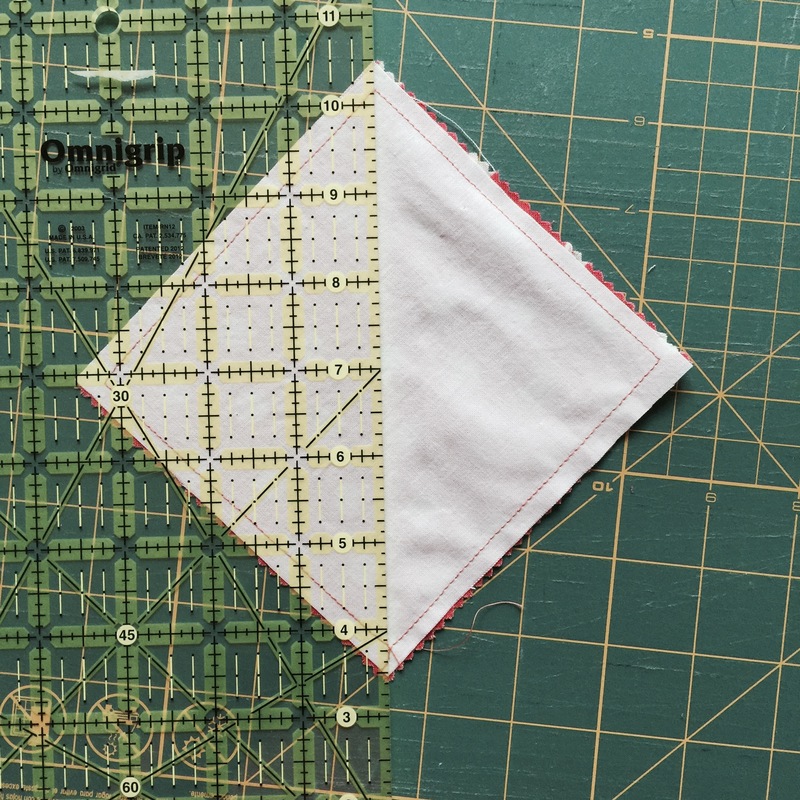 Use a piece of tape to mark a distance of 1/4 inch away from the needle position on your sewing machine, then sew 1/4 from the edge of each side to form a square. 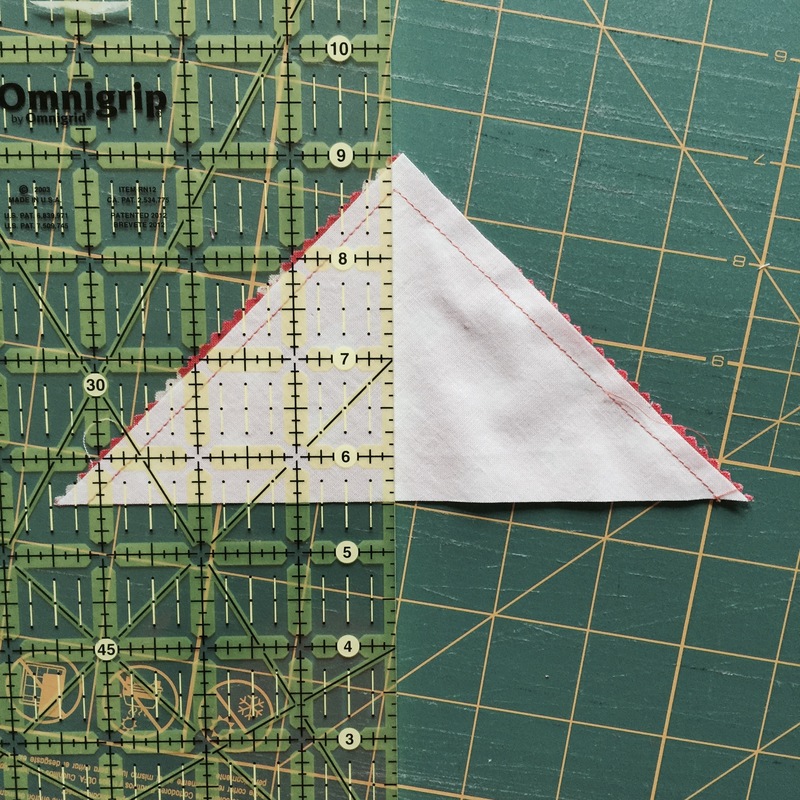 Using your rotary cutter and ruler, cut the square from corner to corner. This gives you four new squares. 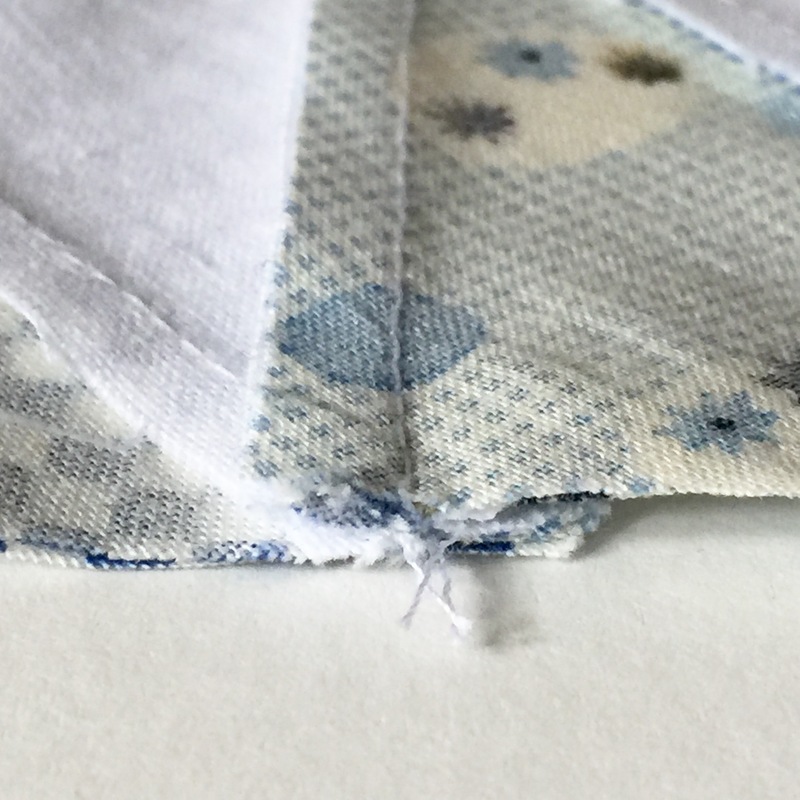 Press squares open with the seam allowance towards the darker fabric, then trim to 3 inches square. 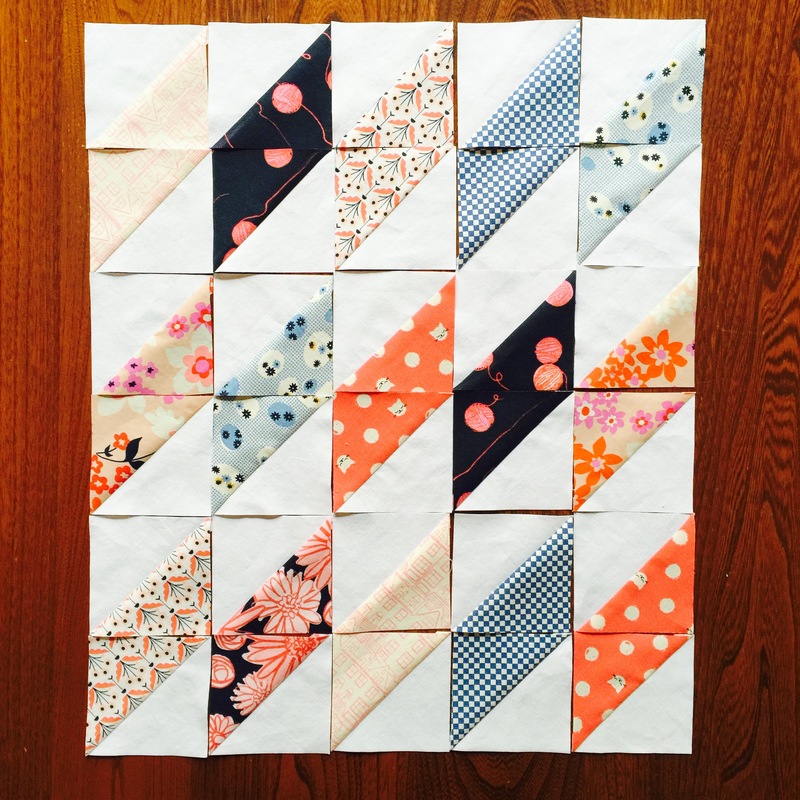 Repeat steps 2 through 4 for each pair of squares. Arrange the squares so that printed triangles form parallelograms. (There will be two squares left over.) Play around with the composition! Sew the squares together in rows, pressing the seams as you go, alternating the direction for each row (for example, all seams to the right in row one, all seams to the left in row two, and so on). Next, sew the rows together, first nesting the seams together as in the following photos, and pinning in place. 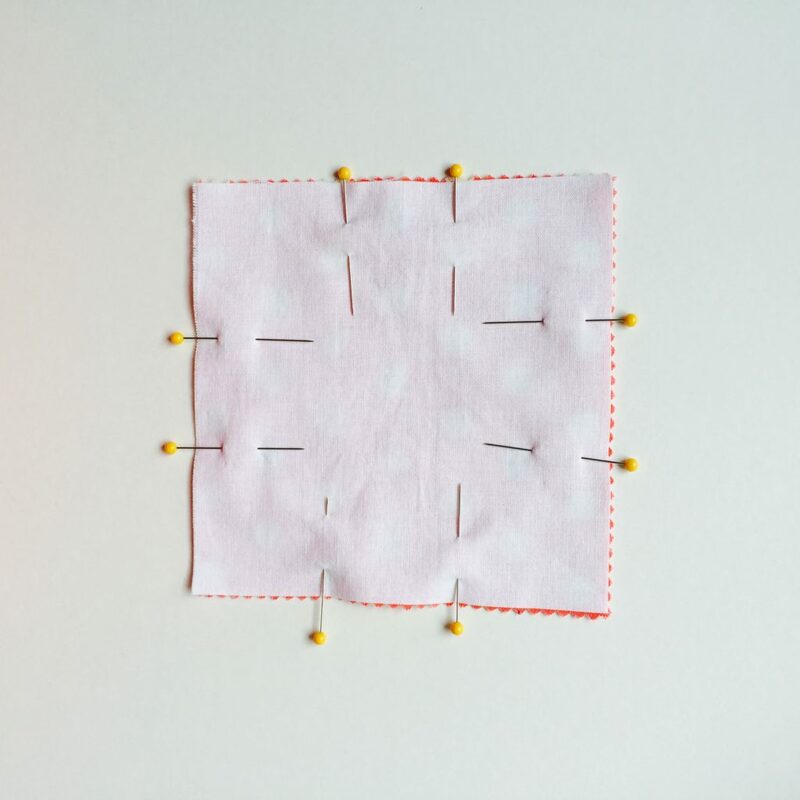 If you have a walking foot, sew the layers together in straight vertical lines, spaced according to your preference. 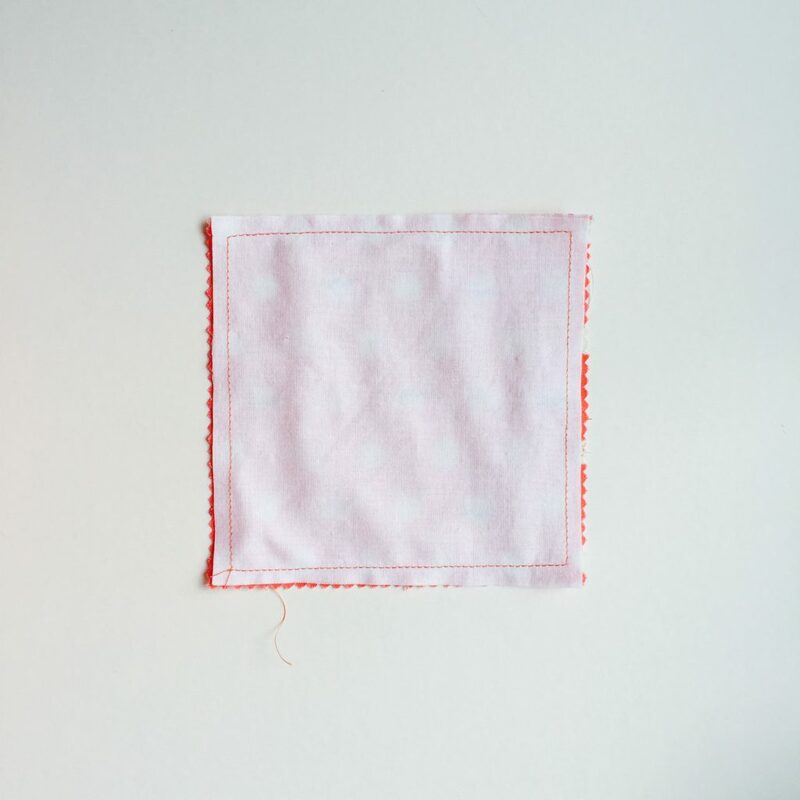 (The quilt in the photographs has 0.5 inch spacing). If you don’t have a walking foot, you can hand-quilt the layers together using yarn or embroidery thread to create a small knotted loop at regular intervals. 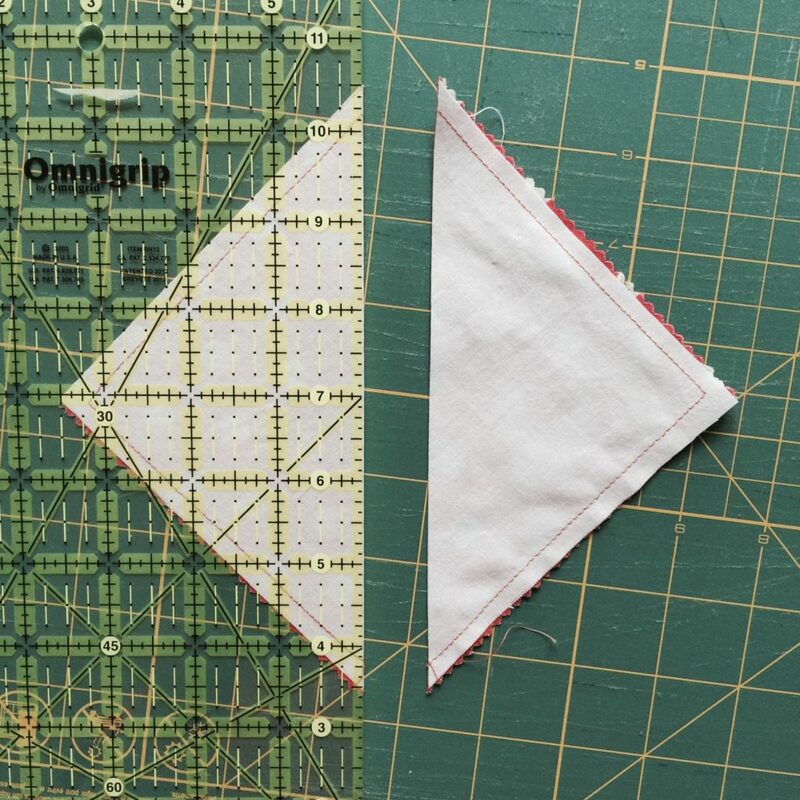 Trim the quilt, making sure that everything is squared up (that is, the overall shape will be rectangular but your corners should be 90 degree angles). Bind the quilt. There are hundreds of great binding tutorials out there so rather than attempt to re-invent the wheel I am going to point you to my favourite instructions by Heather Bailey. Your quilt is finished! 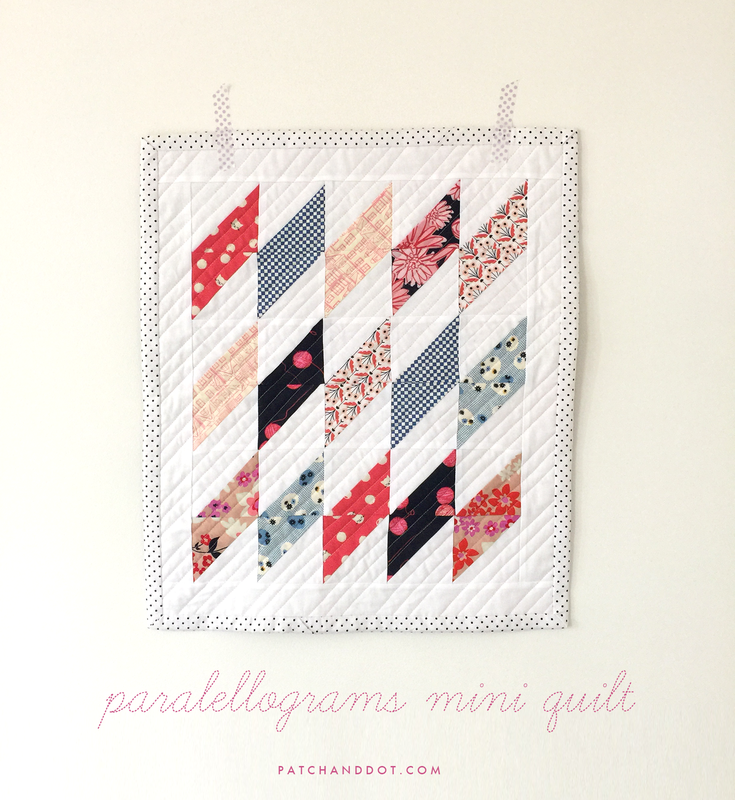 If you try this project please post a link in the comments or tag with #parallelogramsquilt on Instagram … I’d love to see what you create. 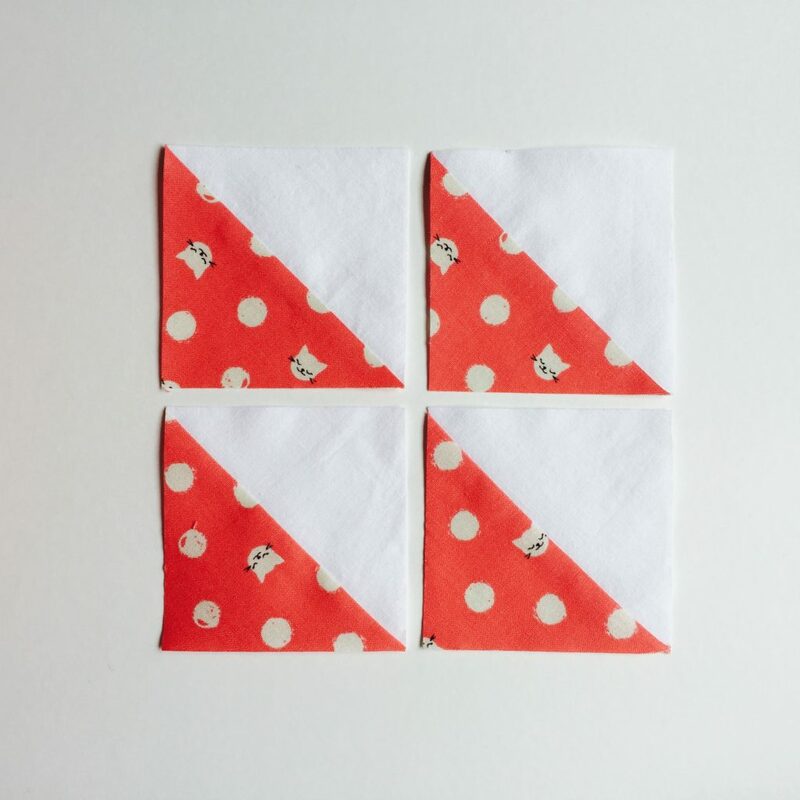 Looking for another mini quilt pattern to try? 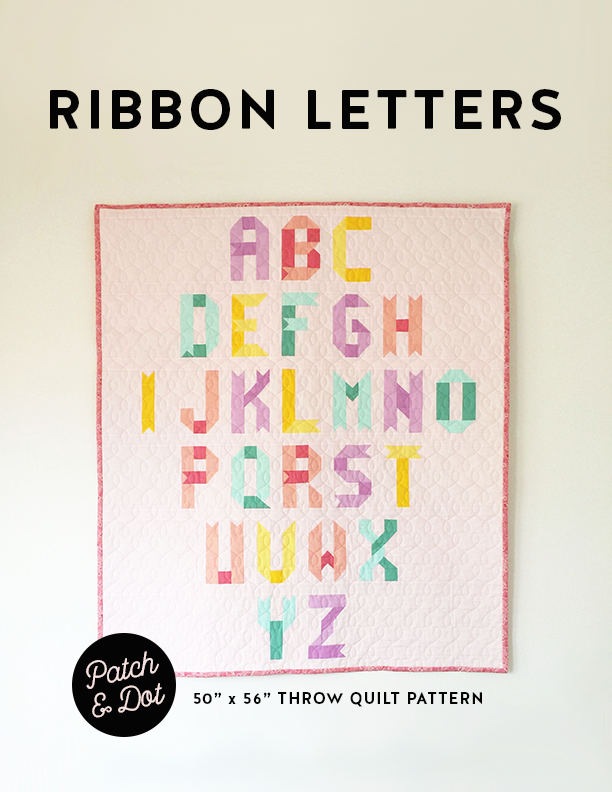 Get a free ABC quilt block pattern dowload by entering your email below! That is really an excellent tutorial with all the details included. You have a reat talent for that. The quilt is charming. Keep up the good work! 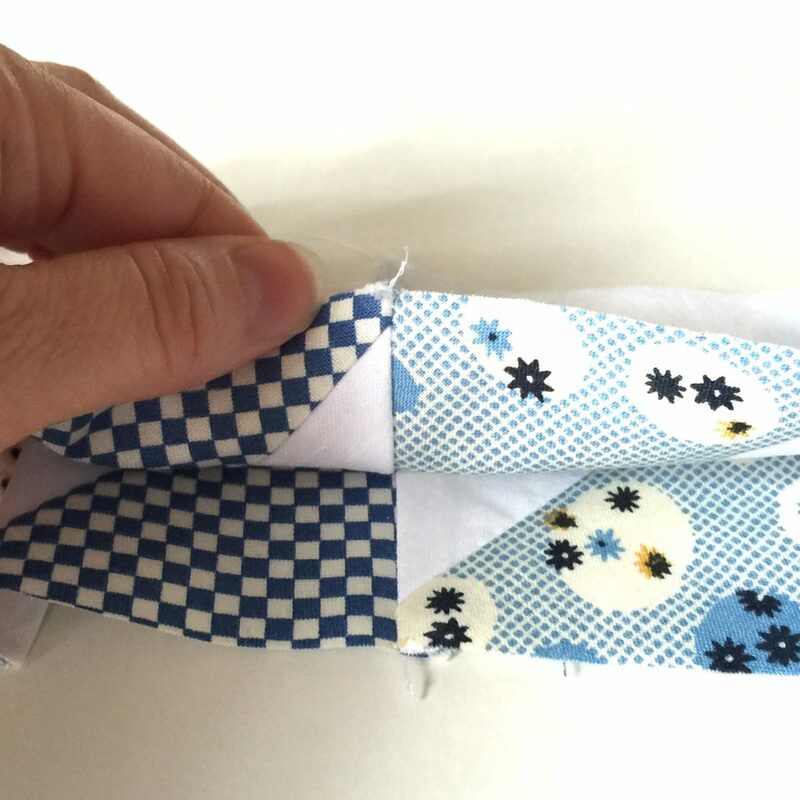 This is such a sweet project for using up some of your fabric fabric scraps. Those parallelograms show them off perfectly! Thanks so much for sharing the tutorial!